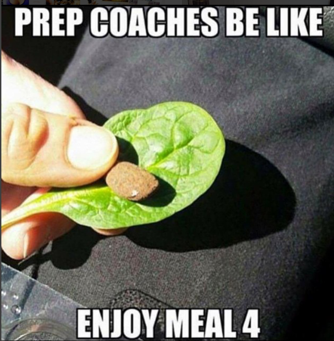 Why should you get a prep coach? As I mentioned earlier, almost everything you need to do a prep can be found by the click of a mouse, the touch of a screen. If you think about it, any answer you could ever need at all can be found on the internet. So the problem does not lie in the availability of the information you’re seeking, but in the issue of finding what’s true and works for you; everyone’s genetic makeup is completely different, and no one should use a plan that’s not 100% a blueprint for their own body. A typical prep lasts 12-30 weeks (although I would certainly advise to aim for the more latter time range), so the margin for error allowance is quite small. Thus, finding the wrong information can be the best recipe for wasting your time. EVERY BODY IS DIFFERENT. Now, let me repeat that, EVERY BODY IS DIFFERENT. No two bodies are the same, and will certainly respond differently. So why on earth do you think clicking the first link on google that says “how to prep for a competition” is going to tailor to you? News flash, it most likely isn’t. So save your time and look for a quality coach, a coach that will take the time to get to know you, physically and physiologically as well. Let’s suppose you assume that you’re very knowledgeable at the art of contest prepping. You have the diet, training, and miscellaneous knowledge at your disposal. Hiring a contest prep coach isn’t really even necessary for you, right? WRONG! This is where most need to check their ego. Think of some of the best athletes in the world – Ronnie Coleman, Phil Heath, LeBron James, etc. They all have or have had coaches. Why? They are all humble enough to know that two minds are greater than one, and that has led them to success. One should never be embarrassed or ashamed to reach out for help. It’s also good to remember that in physique competition, a second pair of eyes is almost crucial and so vital to an athlete’s chance at a win. So don’t let your egotistic thoughts tell yourself “You’ve got this, you’re a self-made athlete!” The fact is, you most likely would have performed, looked and felt better with a little help from a coach. Coaches are a dime a dozen anymore. You see it all the time; that competitor who did one show and now is a “coach”. This is actually becoming a huge problem in the fitness industry – why? Most are completely uneducated and unqualified. This not only leads to the client failing to achieve their potential, but even worse, a seriously damaged metabolic rate and other potential various health risks. If I had a dollar for every time someone came to me with metabolic damage from a previous coach, I wouldn’t even have to coach (but I would anyway, because I love it). EDUCATIONAL BACKGROUND/ CREDENTIALS- This includes, but is not limited to: Bachelors/Masters/PhD degrees in a relevant field ( Exercise Physiology, nutrition, biology, etc. ), Professional certificates (CPT, RD, CSCS, etc), or an Associates degree in a relevant field. SUCCESSFUL EXPERIENCE- Success in numerous clients. The coach should have numerous clients under their belt. Prepping only oneself means close to nothing. In fact, most of these “coaches” were coached by someone else, further decreasing credibility. GENDER DIVERSITY- Look for diversity in sexes (male vs female clients) since they both require different methods. Just because a coach can get a male shredded, doesn’t mean he/she can get a female in the same shape. The physiological requirements differ, so this is an important skill for a coach to possess. A1-Evidence based practice and science. DIVISION DIVERSITY- Has this coach successfully prepped clients in your specific competition division? A bodybuilding coach is not always a bikini coach and vice versa. Each class requires a different look, different posing, different conditioning, etc. Therefore, the coach should have had success in your divisions with numerous clients. 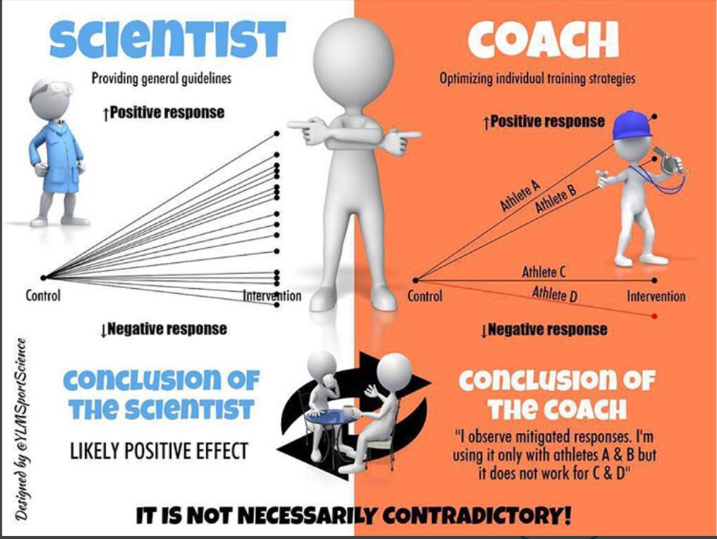 SCIENCE DRIVEN APPROACH- The coach should be educated in nutrition, sports nutrition, physiological processes, etc. Science is the undisputed fundamental tool in dieting and training. EVIDENCE BASED PRACTICE- This builds off of experience. It’s one thing for a coach to have experience, and it’s another thing to use the experience to improve. The coach should find patterns of successful methods among various clients through trial and error. Then, after recording these observations, they should know which body type it applies to, and when to apply the method. This can even be unscientifically proven methods (don’t flip out science lovers). This is how a coach becomes more efficient in their methods. See figure A1 further explanation. PROFESSIONALISM- Is the coach personable? Quick to respond? Are they involved? Respectful? Honest? Motivational? These characteristics are CRUCIAL. Competing is a team effort! A success on stage will often reflect a great coach-client relationship. NO EXPERIENCE- A coach who has only prepped himself and/or coached by someone else. NO CREDENTIALS- What makes this coach any smarter than you? Because he/she said so? Always look for educational proof, ask for certifications, documents ensuring claims, etc. EARLY AGGRESSIVENESS- If the coach starts your 15+ week prep with 6 cardio sessions and a daily diet of 500 calories.. RUN!! This is NOT how it’s done in a healthy and maintainable manner, period. LACK OF ASSESSMENT- If the coach asks a very few questions about your current body composition, diet, and training habits upon initial assessment; chances are they are going to send you a cookie cutter plan they sent to all of their other clients. THE COACH WITH TOO MANY CLIENTS- Have you ever seen that coach backstage with like 30 clients that all look like crap? I know I have. These coaches care about quantity of clients (aka $$$), and not QUALITY of clients (your success). The better the coach-to-client ratio, the more attention you as a competitor will receive- thus a better chance for success. THE SLOW RESPONSE COACH- Taking 1- 2 days to respond to an email or text is normal, and should be expected by a fairly busy coach. However, taking 1-2 weeks to respond to every question is unnecessary, and can certainly hamper your chances for success! “Carbs will make you fat!”. These are bro-science coaches.. move on. PRO-DRUG COACHES- The coach lacks the knowledge necessary to have you stage ready naturally, so they resort to recommending drugs. Let’s face it, if you are competing in bikini, a good coach won’t need you take performance enhancing drugs. The last thing I would like to discuss is the average pricing for coaching/competition prices. I think the best way to approach this is to break it down by tier. These coaches are the elite of the elite, and therefore, should be able to charge the most. After all, you will get what you pay for. Quality guaranteed. • $1,500-$4,000 for a 12-20 week prep. Offseason work- varies, but expect $50-$150 ranges. *Avg. estimations of prices; not absolute. By writing this article I hope to save a few people from the common fates seen all too often in the fitness industry. I hope to one day see healthier metabolisms, fewer bad coach horror stories, more coachable clients who genuinely enjoy being on the stage and the journey to the stage as well. In fact, I hope there will arise a professional license/certification mandatory for coaches to obtain. How great would that be? Do I think I am the perfect coach? NO. But I am certainly striving for greatness, and hope to be mentioned with the greatest some day! I make sure to do my research, use trial and error, and will always happily take constructive criticism. I have by no means covered everything, so use your intuition and common sense when looking. Best of luck to anyone looking for a good coach, and best of luck to you in your next/first competition!